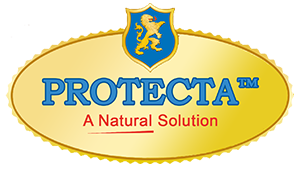 PROTECTA™ is a line of natural food safety products with antimicrobial activity that eliminate pathogenic bacteria and extend shelf life for fresh, frozen and cooked meat, poultry, seafood and other food products. PROTECTA™ products are potent antimicrobials made from natural plant extracts. They eliminate/reduce bacteria and extend shelf life for meat and other food products. PROTECTA™ easily combines with seasoning mixes, injections and marinades.